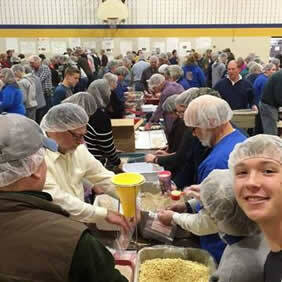 A major service event co-sponsored by Perry Valley Grange and the Greenwood FFA will pack 50,000 meal kits to fight hunger in Perry & Juniata Counties. 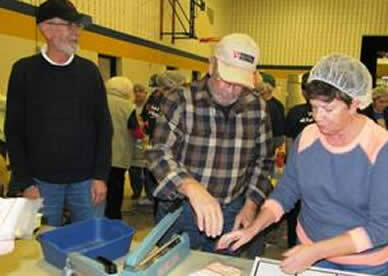 Tremendous community support has raised the $12,500 needed to purchase the meal kit supplies. Up to 200 volunteers are expected to descend on the Greenwood Elementary School this evening from 5-9 p.m. to help with the meal packing. 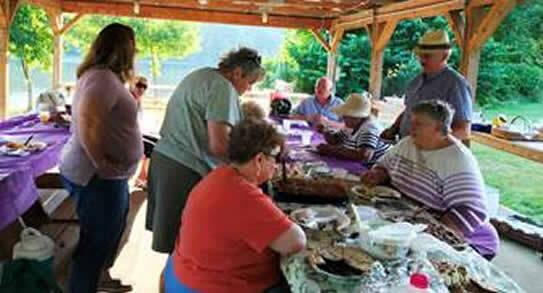 The Grange will provide a light supper to all those helping. Below are some candid photos of a similar meal packing event held in 2016. 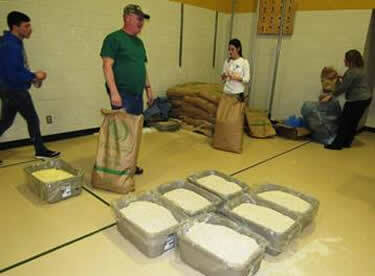 Huge bags of raw materials are opened and placed in tubs for each meal packing team. Volunteers in each assembly line add one ingredient to each meal kit. When kits are complete, they are packed into cases for shipment to local food banks. 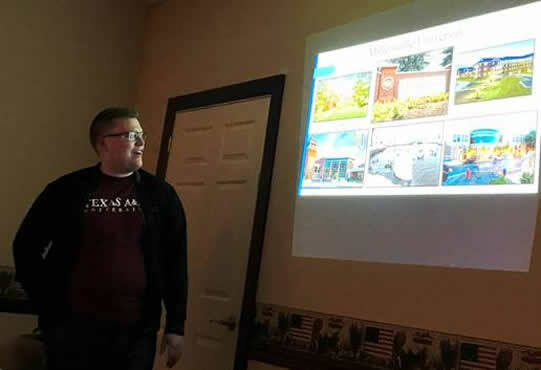 Thomas Gabel, a Perry County native and current Penn State student, shared his experiences in Malaysia at the November 9, 2018, dinner meeting of Perry Valley Grange. It was an outstanding presentation by a very articulate young man who is pursuing study to become a vocational agriculture teacher. 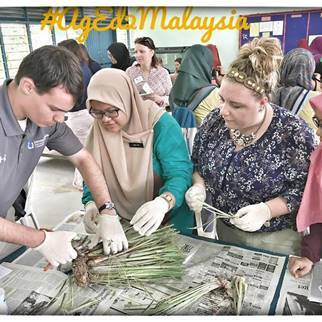 Mr. Gabel spent a month in Malaysia this past summer learning about agriculture, education, and the culture of the country. 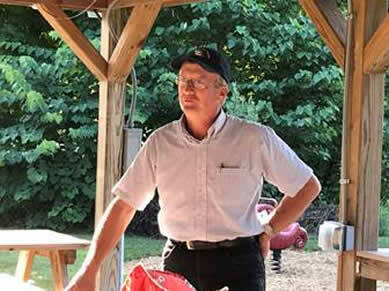 He was accompanied by a team from Penn State and Iowa State students and faculty, as well as agriculture education teachers from across the nation. given by folk singer/historian Van Wagner and the free ice cream sundaes served afterwards. 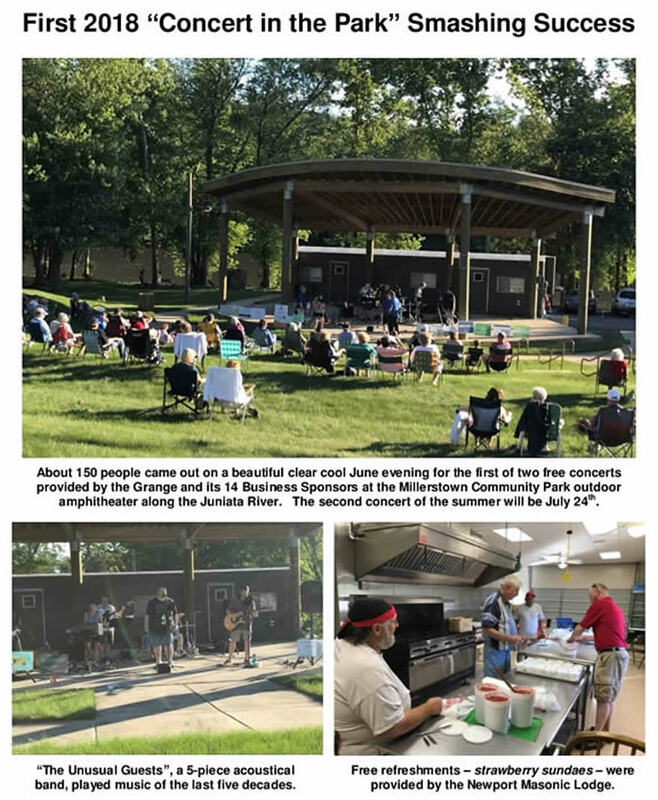 The inside venue was actually an added plus as it provided an opportunity for Mr. Wagner to share some of his own compositions enhanced with slides about the history of the area. 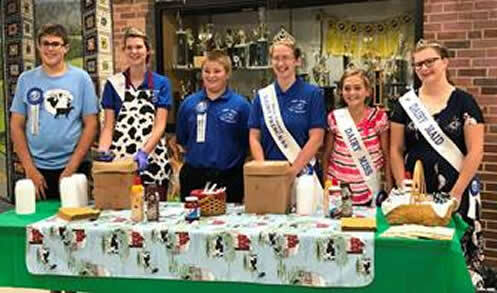 Despite challenges facing the dairy industry, these young people from the Perry County Dairy Promotion Committee were all smiles as they served ice cream to concert go-ers. 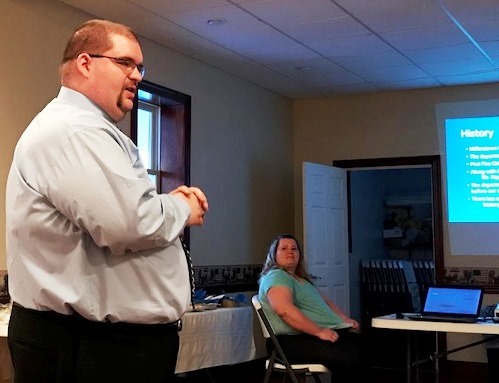 The Perry County Memorial Wall, set to debut in Marysville this fall as a tribute to local veterans, received a $1,000 Grange contribution in July. Grange officers Renee Hetrick (left) and President Linda Byers (right) made the presentation to Laura Steele who initiated the project. 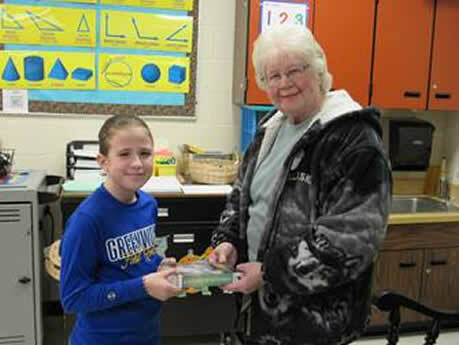 Each year Perry Valley Grange sponsors an elementary school essay and poster contest open to all fourth grade students in the Greenwood and Newport Schools. The purpose of the contests is to encourage participants to develop their writing and artistic abilities on a specific subject. 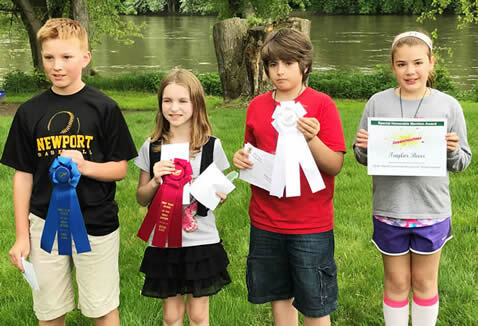 In 2018 the contests encouraged students to describe in their essay or show in a poster the essential lessons learned from the adults in their lives (parents, teachers, counselors, neighbors, police, etc.) about the importance that our environment plays in our everyday lives. 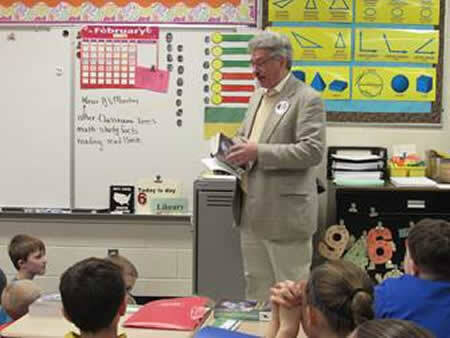 Ideas included but were not limited to: recycling, planting trees, butterfly gardens, soil conservation, and wildlife. 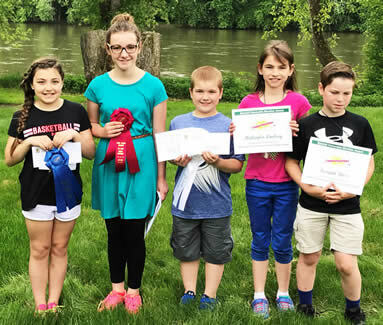 This year there were 163 entries and awards totaling $400 were presented by the Grange as part of the field trip day held at the Millerstown Community Park. 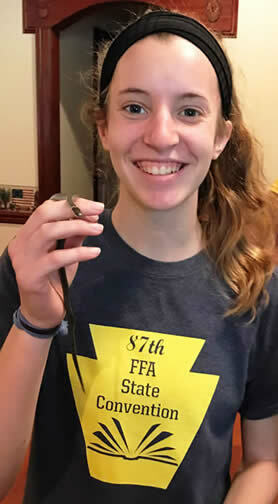 The annual Ag Day event included many learning opportunities on agricultural and environmental topics and the presentation of awards in the Grange’s annual essay and poster contests on the theme “The Environment Around Us”.Here Rachel Peters from the Greenwood FFA shows students a garter snake. 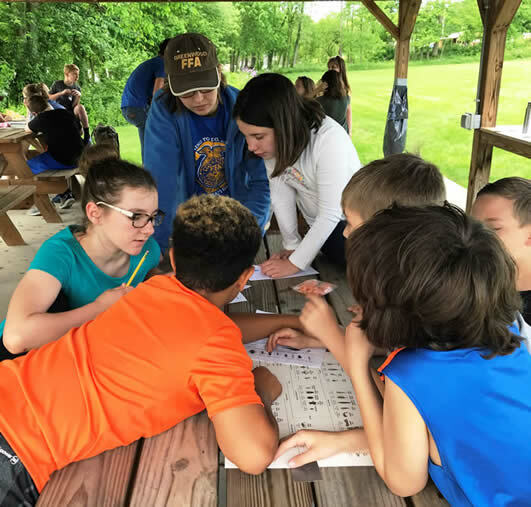 Nearly 150 fourth grade students from Greenwood and Newport Elementary Schools participated in a recent field trip held at the Millerstown Community Park. Greenwood FFA member Abby Taylor (standing, center) guided students through a water quality simulation, one of the many hands-on learning centers featured at Ag Day. This annual educational event is jointly sponsored by Perry Valley Grange and the FFA chapters from two local high schools. The butterfly house was an especially popular new attraction at this year’s Ag Day. The butterflies fluttering around to the delight of the children were purchased in the chrysalis stage and nurtured carefully for many weeks so they would emerge at just exactly the right time. 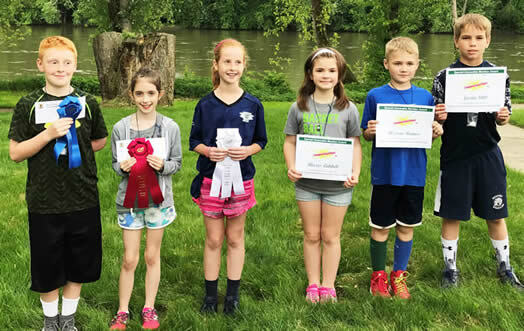 Continuing the success of the past two years with a day-long educational outing focusing on agriculture and environmental issues, the 2018 Ag Day for fourth grade students from Greenwood and Newport Elementary School was held May 23, 2018, from 9 a.m.-2 p.m. in the Millerstown Community Park, 110 West Juniata Parkway. The event is co-sponsored by Perry Valley Grange and the FFA chapters at Greenwood and Newport High Schools. During the morning session, students had the opportunity to participate in the following hands-on learning stations: Wildlife led by retired Greenwood teacher Sam Ritzman; Aquatics by Rich Morder of the PA Fish & Boat Commission, Agriculture in the Environment by Liz Bosak of Penn State Extension, Plant Growth by Newport FFA, Watersheds by Greenwood FFA and Pollinators/Live Butterfly Tent by Perry Valley Grange. 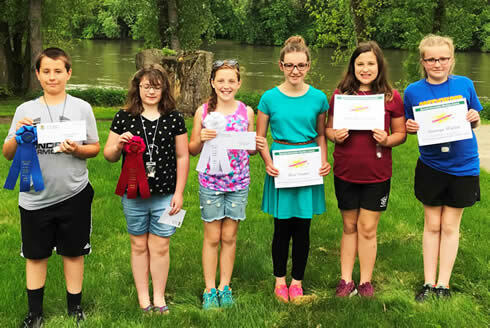 Following lunch, awards were presented for the annual Grange sponsored essay & poster contests. During the afternoon students participated in a macroinvertebrate simulation and worked through the scientific method to determine the waterway with the highest water quality. 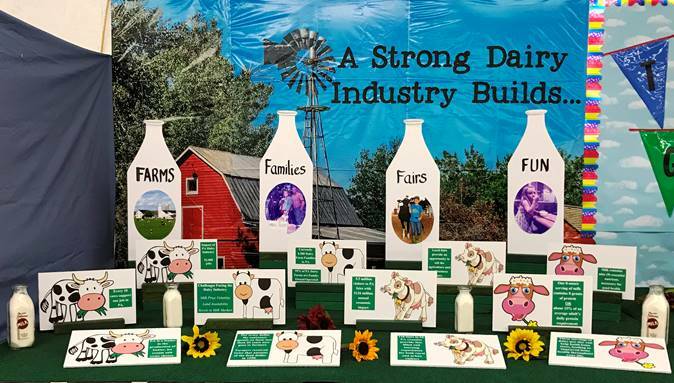 Ag Day has become a much anticipated field trip that teaches local children about the many agricultural and environmental issues that affect their daily lives. Greenwood FFA teacher and Grange vice president Krista Pontius was the general chairman of the event. that fights childhood hunger by providing weekend backpacks of food for students. 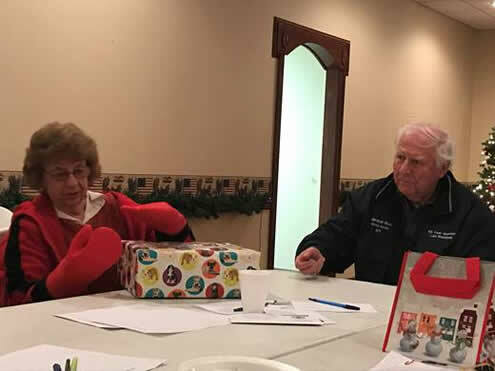 emergency services providers - recruiting volunteers, extensive training requirements, liability concerns, and fund raising issues. to all third grade students. 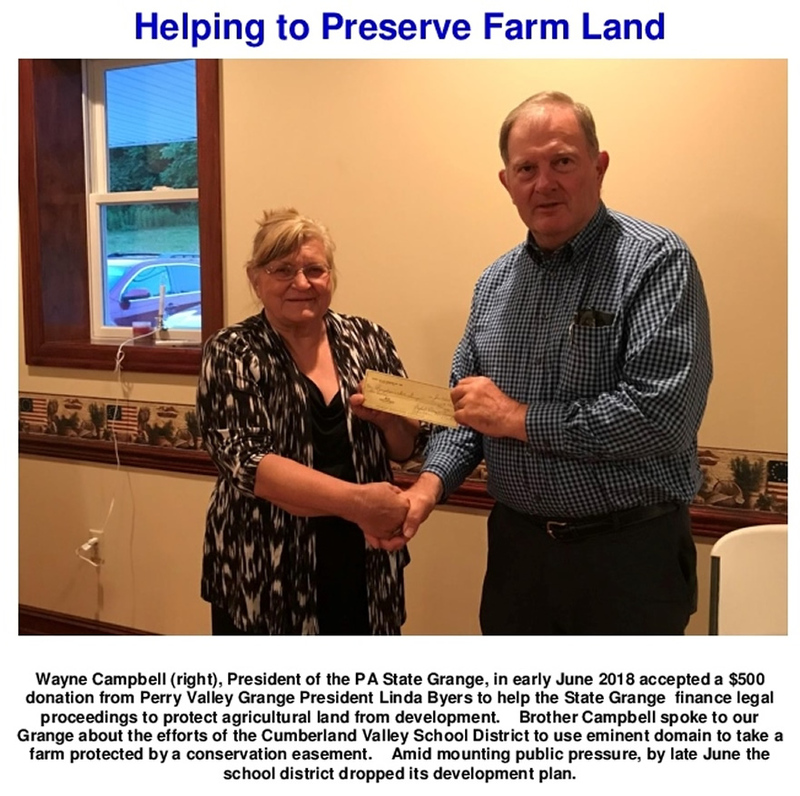 Funding to purchase the books was provided by the Perry County Pomona Grange. 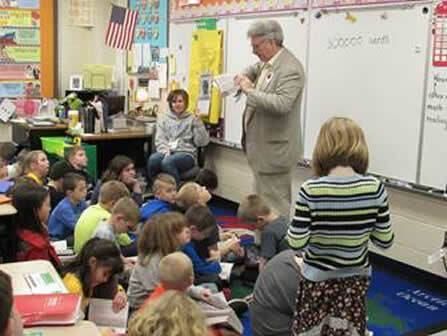 The students were shown how to use the various helps found in a dictionary by Doug Bonsall. This student version included much interesting information about such things as maps of the world, facts about U.S. states and the history of our Presidents. 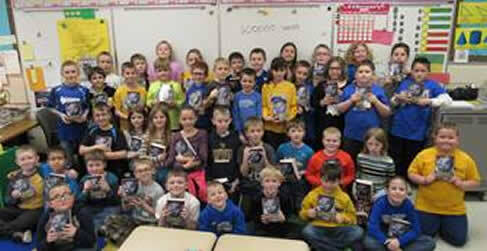 Lots of smiling, happy faces after students received their personal dictionaries. 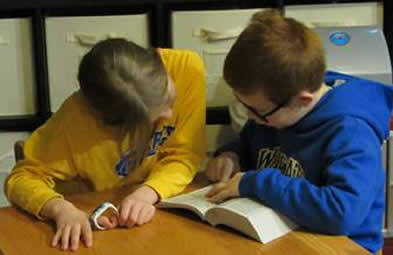 Can you find the longest word in the dictionary? 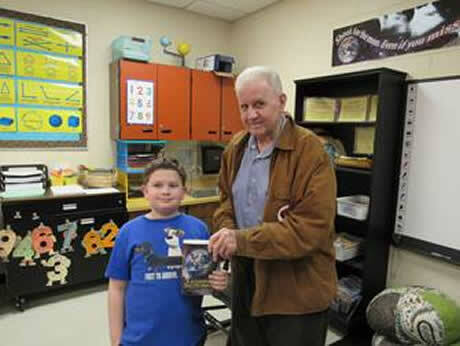 Grangers Bill Cameron (above left) and Peg Bolton (above right) helped with the book distribution to each student. 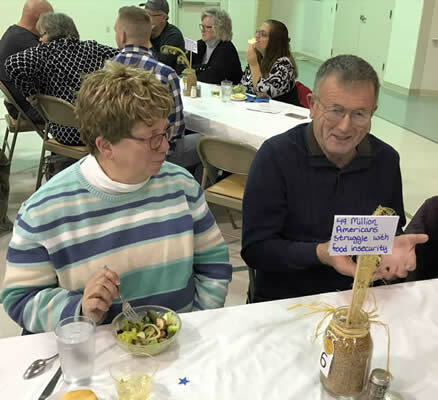 Grange member Edgar Byers (right) talks about food insecurity issues at the Hunger Banquet held on February 2, 2018, co-sponsored by Perry Valley Grange and Greenwood FFA. Brother Byers appears to be one of those persons at the event who found themselves waiting to receive a meager meal of rice and beans while others at the table were served a literal feast. 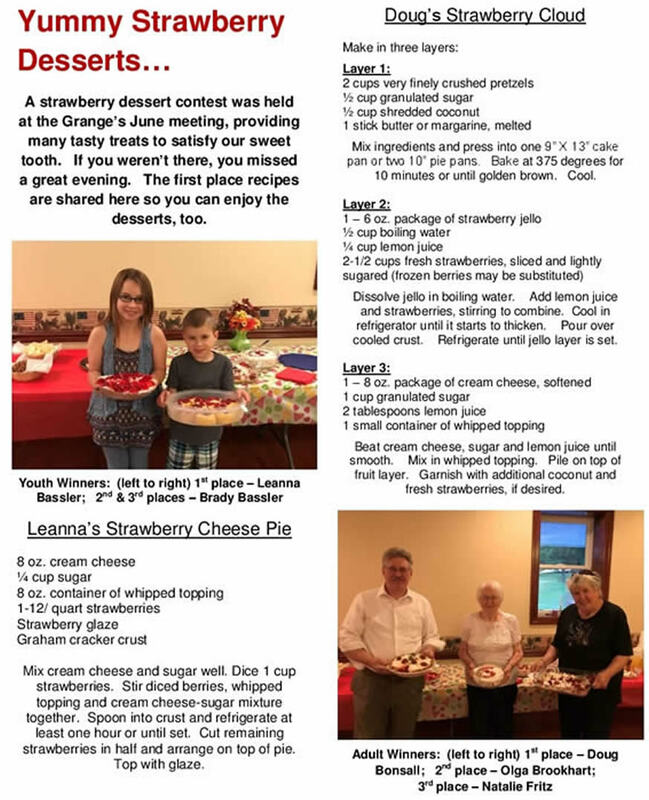 The point of the event was to raise awareness about hunger and how much of the imbalance of food availability is often a matter of over which persons may have little control. 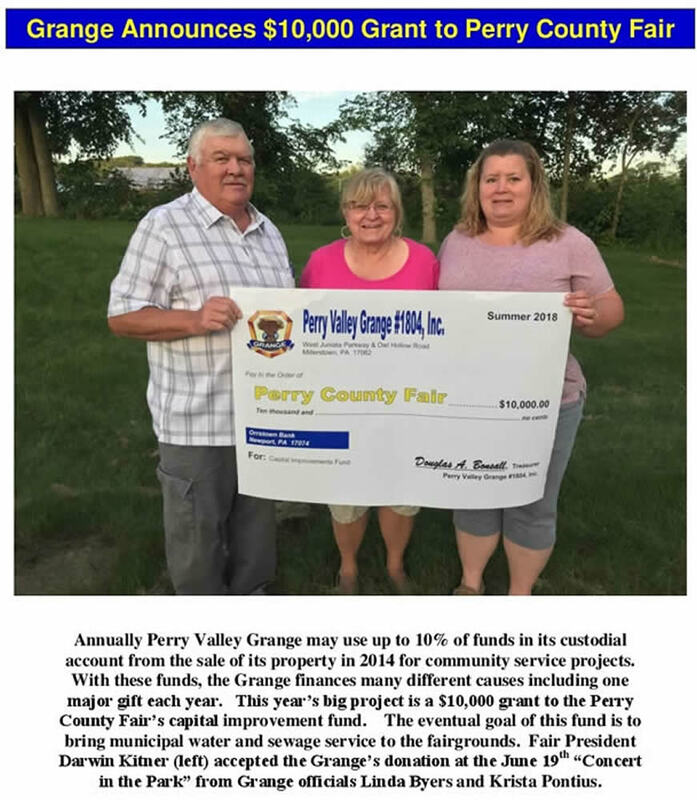 Proceeds of $3,585 realized from the 2018 Hunger Banquet event jointly sponsored by Perry Valley Grange and the Greenwood FFA were presented to the Perry County Food Bank to fight hunger in the local community. 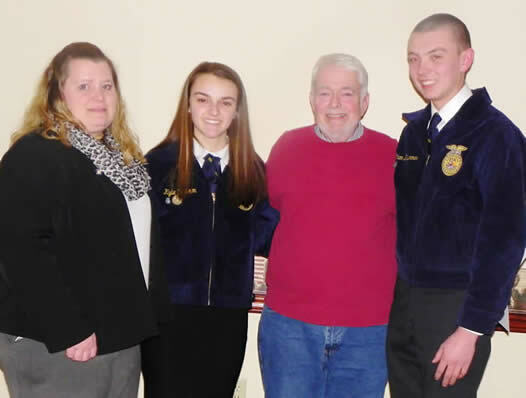 Food Bank Director John Kiner (third from left) accepted the funds from: (left to right) Krista Pontius, Grange vice president and FFA Advisor, and FFA representatives Kylie Cameron and Ethan Brummer. change has a significant economic effect on agriculture.